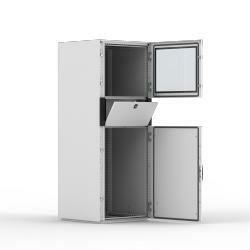 This mild steel floor standing enclosure, MCM, is pre-configured with integrated accessories to ease mounting of industrial computers and peripherals. It can be ordered with one single item number, with all relevant accessories included, which simplifies procurement. Frame: 1.5 mm steel plate. Roof and side panels: 1.35 mm steel plate. Doors: 2 mm steel plate. Bottom plates: 1 mm galvanized steel. Mounted with two hinges per door. Top door with safety glass. Viewing area for 14"- 21"monitor. Two C21323 locks for the top door, and espagnolette two point locking system, with standard 3 mm double-bit lock for the bottom door. Mounted with hinges, allowing left or right hand opening. Including door frame, with 25 mm hole pattern. Espagnolette four point locking system, with standard 3 mm double-bit lock. Vertical opening keyboard panel. Sliding mouse pad, allowing left or right hand use. Max keyboard dimensions: 470 × 190 × 45 mm. C21323 lock. Consists of three or four (D> 600) pieces. Two tone finish. Doors, side panels, roof and frame in RAL 7035 structured powder coating. Keyboard side panels and monitor door top cover in RAL 7015 structured powder coating. Other colour schemes optional. Special design of roof and side panels for theft security. All panels are only accessible when the doors are unlocked. Your own company name can be inserted in the top cover (option). IP 44 | IK 10. With keyboard tray opened, reduces to IP 30. Equipment shelves need to be added. Frame with fitted rear door, side panels, roof panel, monitor door, keyboard panel, bottom plates and monitor shelf, with clamps to fix the monitor. Delivery also includes earthing bolts. The enclosure is delivered on a pallet identical to the enclosure width. All packing material is recyclable.